Today is our 25th anniversary! On such a big day I’m gonna go ahead and be happy and proud with no holding back. It’s a universally acknowledged accomplishment to celebrate openly. That being said, I don’t take credit for success or rest on my laurels. By God’s grace we have come this far and we will lean heavily on His grace to continue on. But to His glory, we are together and happy. The earthly odds were against us. I was only 18 when we married. He is 10 years older than me. 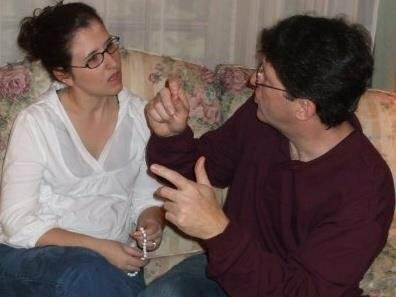 People talked to my parents, trying to prevent our relationship. Two of my teachers showed up where I worked to question me about my future and my goals, obviously opposed to my choices. One substitute teacher told me flat out we wouldn’t make it two years. With all this great support, we headed into marriage without any doubts ourselves. I never questioned if I could live with him. I knew for sure I couldn’t imagine living without him. If I had followed conventional wisdom, oh what I would’ve missed, like our first sweet baby who arrived ten months later. She was such a joy to raise, we just kept adding on til six kids were here to make our lives complete. If you’ve met my kids, you know I got a lot better than I deserve. Then to add two sons-in-law and a grand baby! This is the very picture of good measure, pressed down, shaken together, running over. There were trials, but so much less than what others have to go through. Financial struggles, several job lay-offs, a house fire, night school, hospital stays and too many funerals. We grew up together and forged a bond that resembles the alchemy of metals than makes and refines silver. The silver anniversary makes a lot of sense to me now. Many elements come together through fire to produce a shimmering, highly conductive product that can be useful, or decorative. I’m getting less decorative with every passing year so I’m striving to be more useful. And let me just say, the conductivity after all these years is all good. Ok, moving on. This feels like rambling but I couldn’t let this big milestone pass without writing about it. I have to say thank you to God for being faithful to us even when we were not faithful to Him. Thank you to my family for the strong arm of support as we swam against the tide. And thanks to my husband for knowing how to do everything, being willing to do everything and for being the best person to do nothing with. Your heart has been open to God and to me, and that is the one essential element needed for a beautiful marriage. I love you and I love us. Here’s to the next 25 years with you!